Garmin Pay – No wallet? No problem! The Faster, Safer, Convenient Way To Pay. A watch is already an everyday accessory for most of us, but with Garmin Pay is could have more sues than ever before! Garmin Pay is the ideal contactless payment solution, that has been specifically designed for people who are always on the go. Whether you are grabbing a cup of coffee on the way to work, or a quick snack after your morning run, Garmin’s payment solution is the perfect companion. Allowing you to make payments on the go, quick and effortless with a simple movement of the wrist! No wallet? No phone? No problem. Where can Garmin Pay be used? 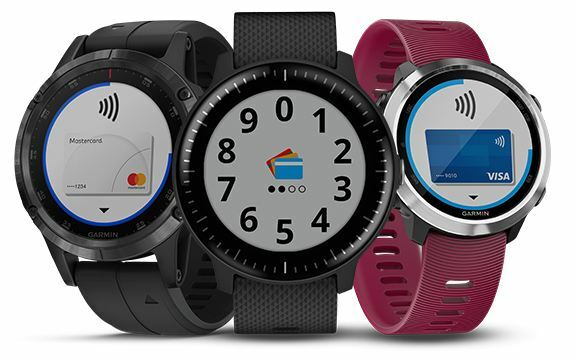 You are able to use your payment enabled Garmin watch almost anywhere that you are able to make contactless payments, so supermarkets, clothing store, food vendors etc. can all be made simple with this fantastic contactless payment solution! Garmin Pay works with the majority of credit and debit cards, form major banks, and by adding your bank card to your devices payment wallet, you will be able to enjoy all the perks, and benefits of your physical cards, right on your wrist. Of course, with the same restrictions as standard forms of contactless payment! More and more banks are being made compatible with Garmin Pay everyday, so if your bank is not currently supported, check back soon and it may update in the future! You can check the participating banks and cards that are currently accepted here; Garmin Pay™ Participating Banks. Making payments in this fashion is so easy, with just a few quick touches Garmin pay is easily accessible from your compatible Garmin watch. Then all you need to do, is enter your pass-code, choose the appropriate card from your virtual Garmin wallet, and then hold your wrist near the card reader, and that’s it, payment done! No need to count the change in your wallet, or find your phone in your bag, everything is on your wrist! Security is always a concern when it comes to banking and payment details. However, Garmin takes security very seriously, making sure that your information is secure as possible at all times. Garmin Pay will protect your money and information by using watch-specific card numbers and transaction codes every time you make a purchase. Your card number is not actually stored on your device, on the Garmin servers or passed to merchants when you pay, so you pay with confidence and security! You can also have access to Garmin Pay via the Forerunner 645 and the D2 Delta.